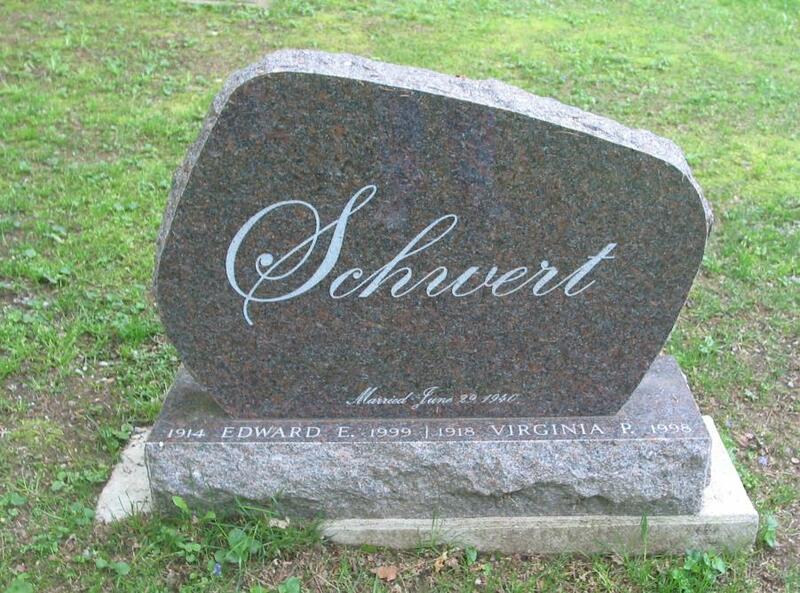 Edward Joseph Schwert was born on August 2, 1914, in Buffalo, New York. He was baptized on August 30, 1914, at Our Lady of Lourdes R.C. Church. 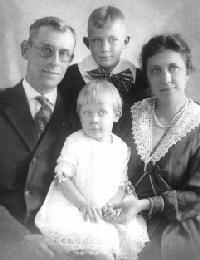 Edward was the oldest of three children for Joseph and Catherine (née Ehrler) Schwert. At the time of Edward's birth, the family resided at 81 Florida Street. When Edward was a teenager, Catherine separated from Joseph. The reasons for this separation vary, but it was at about this time that Catherine came into a considerable inheritance upon the death of her father, Edward Ehrler. Catherine forbid Joseph any visitation rights to the three children. Edward's middle name of "Joseph" was replaced with his mother's maiden name, "Ehrler," either by Catherine or by Edward. We have been unable to ascertain if this name change was done legally, although Edward's documents later appear to make official the name change. 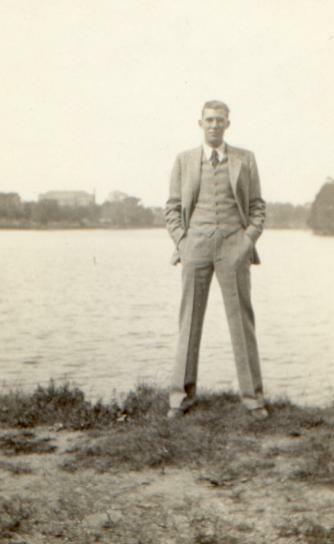 Edward Ehrler Schwert at Notre Dame University, circa 1932. Catherine wished for her two sons a medical profession. Edward headed for Notre Dame University, where he spent a year before being called back to Buffalo by his mother. There, Edward enrolled in the University of Buffalo School of Dentistry, from which he graduated with his DDS degree in 1938. 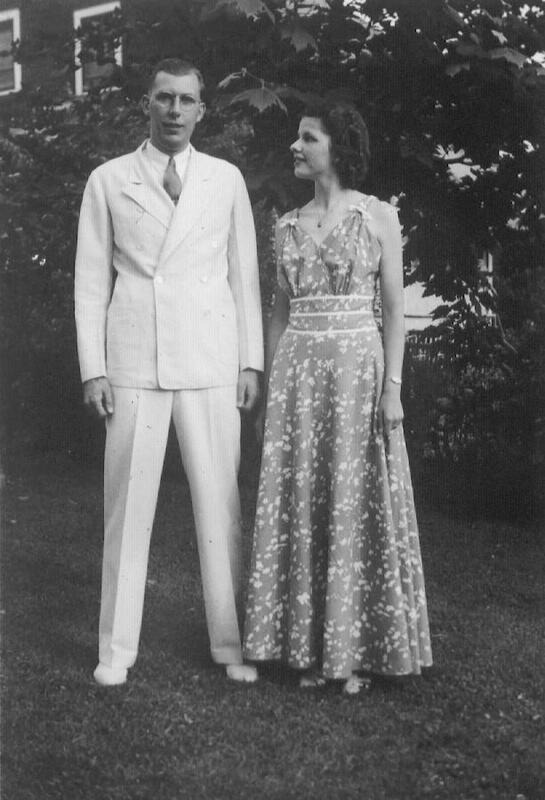 While at a dance, Edward met Virginia Peters -- a student at the University of Buffalo and youngest daughter of Otto H. and Louise (née Juergens) Peters. (Otto was president of H.L. Peters Sporting Goods in Buffalo and, later, mayor of Williamsville, NY). Edward fell in love with this pretty woman and proposed marriage to her. Catherine was deeply opposed to the relationship, in part because Virginia was Presbyterian. 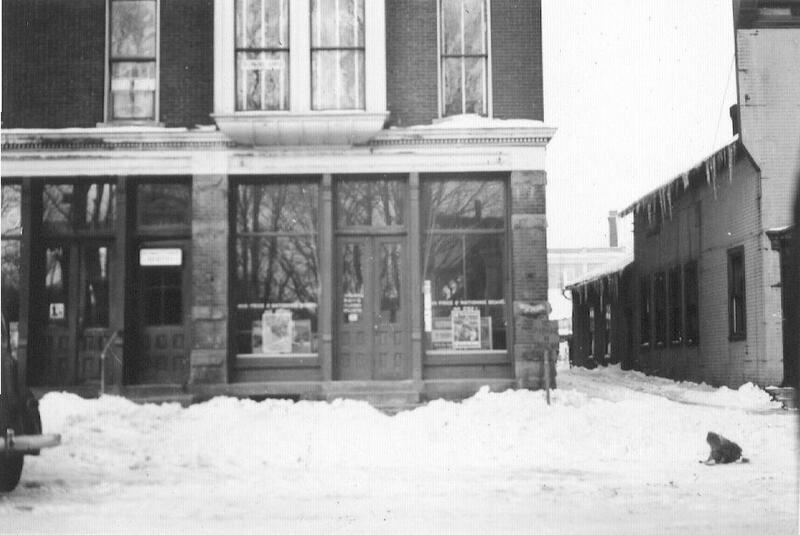 Edward purchased a dental practice in the tiny village of Belmont (Allegany County), far enough away from Buffalo to now be finally independent of his mother. The practice was on the second floor of 46 Schuyler Street, at the south side of the Belmont Hotel building. 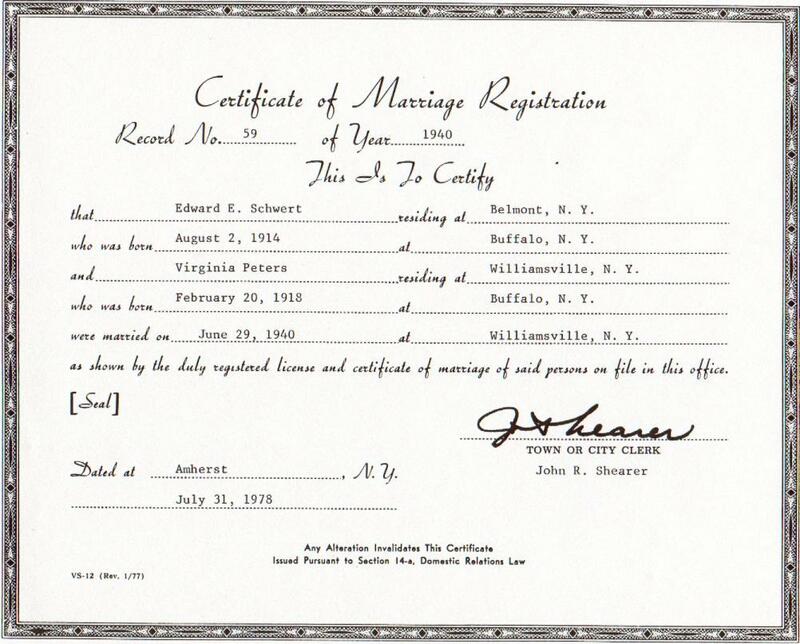 On June 29, 1940, Edward and Virginia were married at Saints Peter and Paul R.C. Church in Williamsville, NY. Because Virginia was not Roman Catholic, the couple was prevented from holding the service within the church's sanctuary. Edward and Virginia (née Peters) Schwert. Undated photo, probably about 1940. 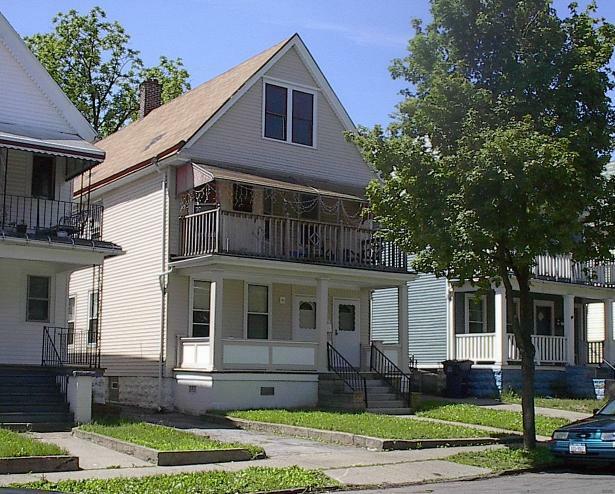 Edward and Virginia took up residence in Belmont, eventually purchasing the Laidlaw house at 19 Genesee Street. There, on a lot bordered by a river, a busy railroad, a jail, and a state highway, they managed to safely raise three sons. 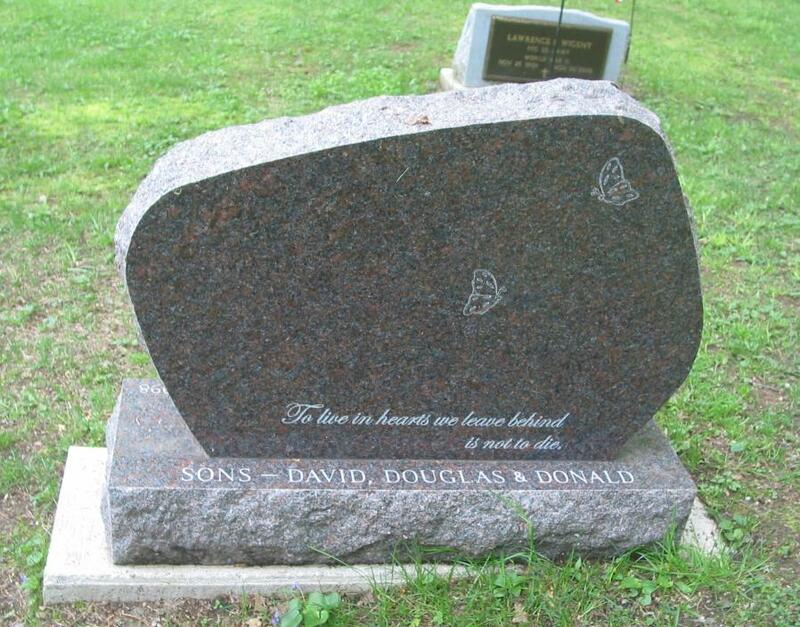 Although Edward remained estranged from his mother (the two reconciled shortly before her death in 1967), Virginia would dutifully take her sons to Buffalo to visit with their grandmother. And although the sons had to be raised Roman Catholic, Virginia made sure that they always knew the "other side of the story." Taking the photograph for the annual family Christmas card became a big production, but these cards today provide a wonderful photographic record of family history. 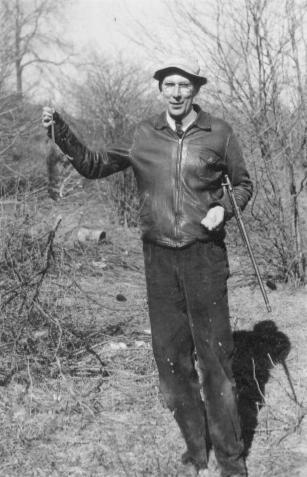 Edward found his greatest relaxation in spending weekends at some woodland with a pond that he had purchased in nearby West Almond Township. He was adamant about exercise and walked to/from his dental office twice daily. Any guy happening to walk down the same sidewalk as Edward would be cheerfully greeted with a loud "Hey-ya fellow!" Edward actively maintained his dental training and would frequently return to various university settings to upgrade his skills and knowledge. After 44 years of practice, he retired in 1984. 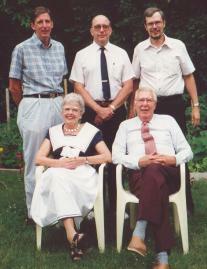 Edward and Virginia were active members of the community. The couple liked to travel and, in later years, Edward would show slides of their trips to community groups, nursing home residents, and inmates at the local jail. While very public in his presence, Edward remained to his death extremely private about his childhood and the "Schwert" side of his ancestry. Virginia died on April 11, 1998, after a long and painful battle with cancer. Edward was, himself, suffering with cancer and died on March 3, 1999. 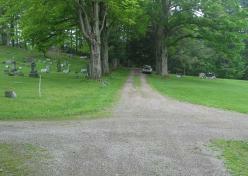 Both are interred in Section L, Lot 124-2, Forest Hills Cemetery, Belmont, NY. 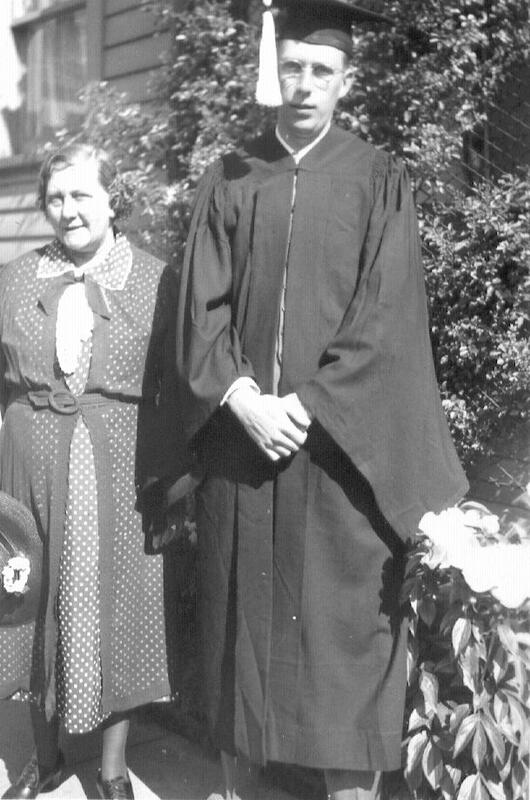 Edward Joseph Schwert, with his mother Catherine (née Ehrler) Schwert. Photo taken in December, 1916. 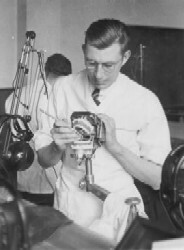 Edward Ehrler Schwert, University of Buffalo School of Dentistry, 1936. 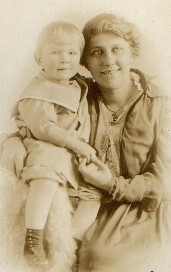 Catherine (née Ehrler) Schwert with her son, Edward Ehrler Schwert. Photo taken on the day that Edward received his DDS degree from the University of Buffalo, 1938. 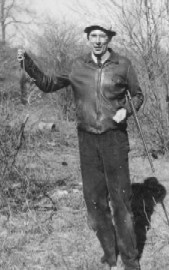 Edward Ehrler Schwert, hunting, May, 1943. 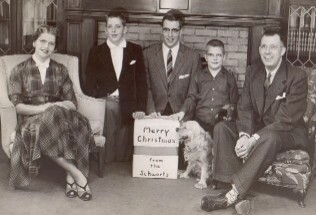 1957 family Christmas card photo. 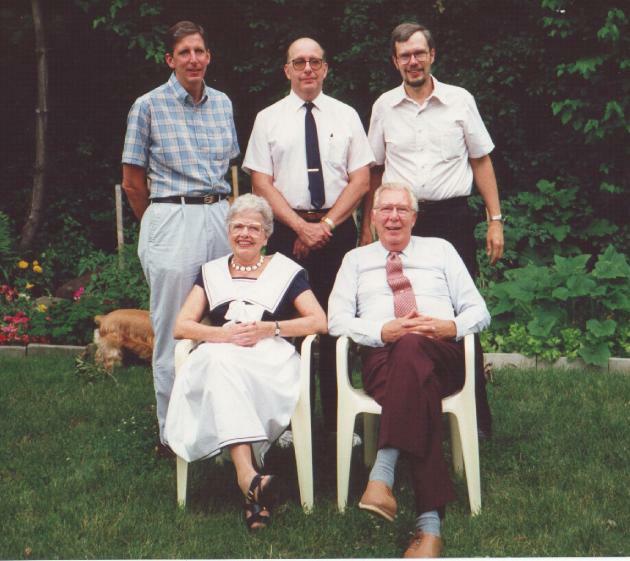 Left to right: Virginia (née Peters), Douglas, David, Donald, Scamper, and Edward Ehrler Schwert. 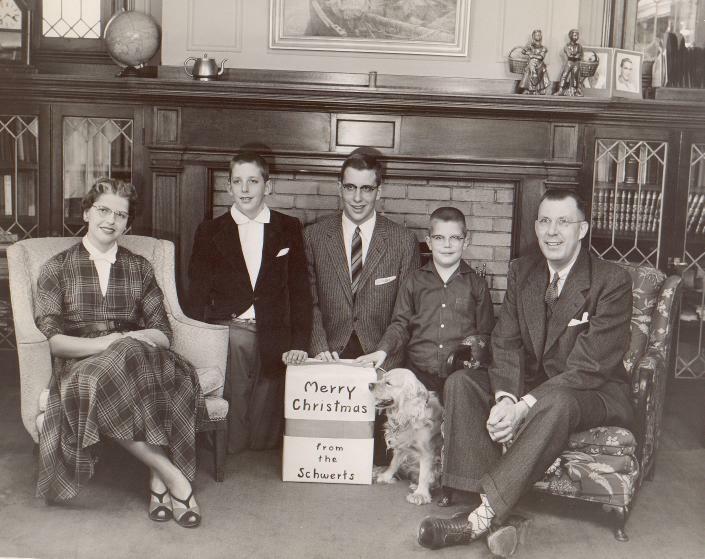 Photo taken by Edwin Gott at the Schwert residence, 19 Genesee Street, Belmont, NY. 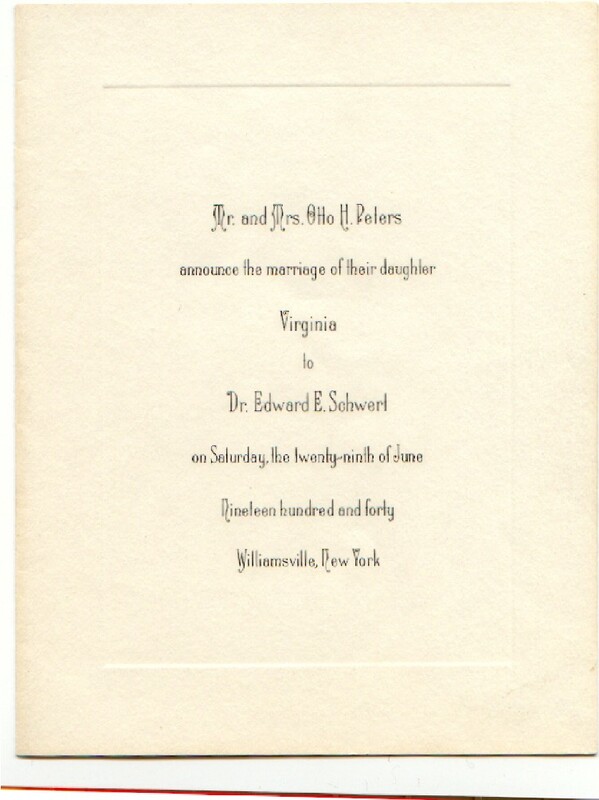 50th wedding anniversary of Edward Ehrler Schwert and Virginia (née Peters) Schwert. 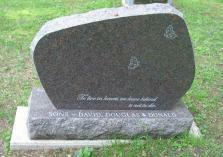 With them, left to right, are their sons Douglas, David, and Donald. 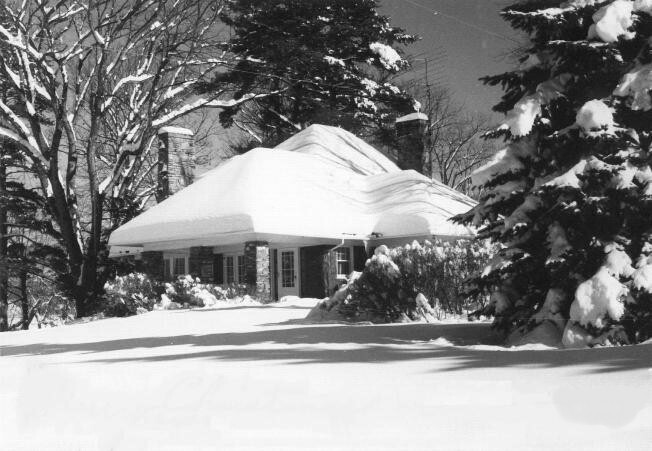 June 29, 1990, residence of Rev. 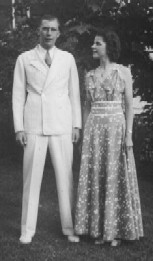 Douglas and Janet (née Longseth) Schwert, Glenview, Illinois. Gravesite for the cremains of Edward Ehrler Schwert and Virginia (née Peters) Schwert, Section L, Lot 124-2, Forest Hills Cemetery, Belmont, NY. 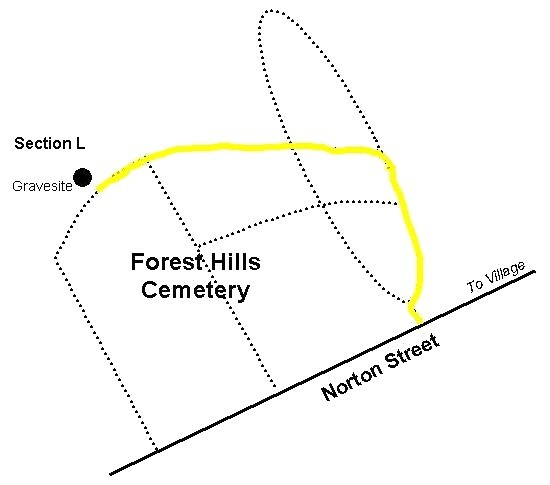 A map for locating the gravesite is available here; follow the yellow portion of the map route. Grave of Edward Ehrler Schwert and Virginia (née Peters) Schwert, Section L, Lot 124-2, Forest Hills Cemetery, Belmont, NY. Back side of gravestone for Edward Ehrler Schwert and Virginia (née Peters) Schwert, Section L, Lot 124-2, Forest Hills Cemetery, Belmont, NY. 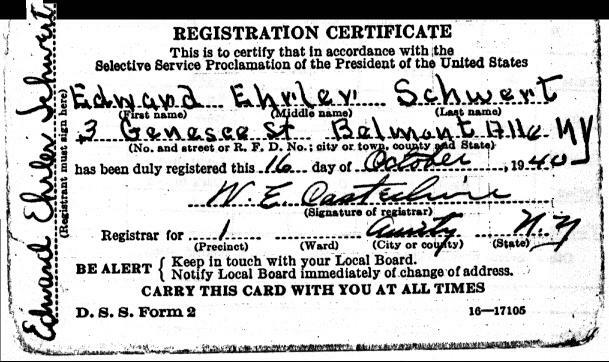 Birth Certificate: Edward Joseph Schwert, born August 2, 1914. Certificate listing for his mother is in error: it should read "Mrs. Joseph August Schwert." 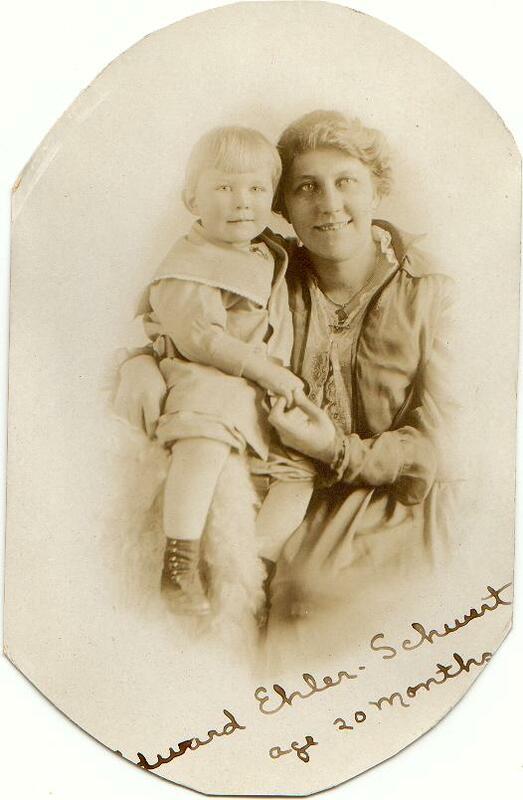 Baptismal Record: Edward Joseph Schwert, born August 2, 1914 and baptized August 30, 1914. French Church of Our Lady of Lourdes R.C. Church, 1107 Main Street, Buffalo, NY. 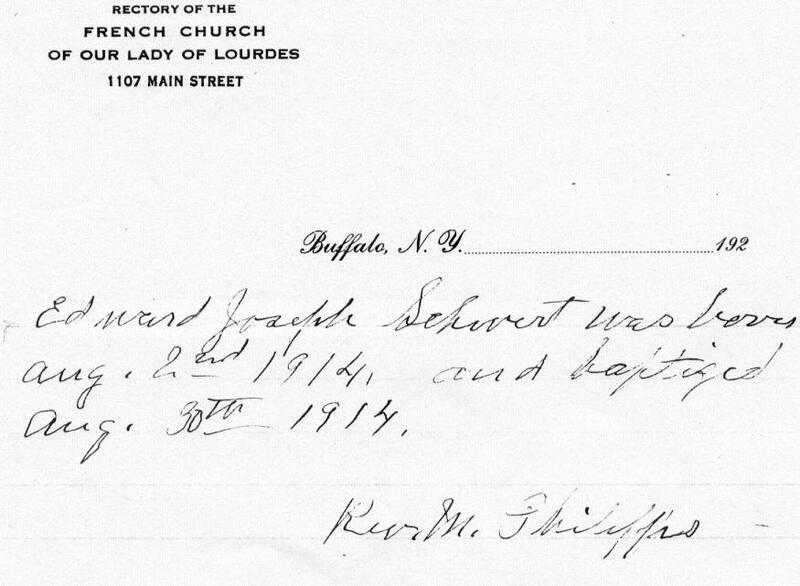 Baptismal Record: Church ledger record for Edward Joseph Schwert, born August 2, 1914 and baptised August 30, 1914. French Church of Our Lady of Lourdes R.C. Church, 1107 Main Street, Buffalo, NY. 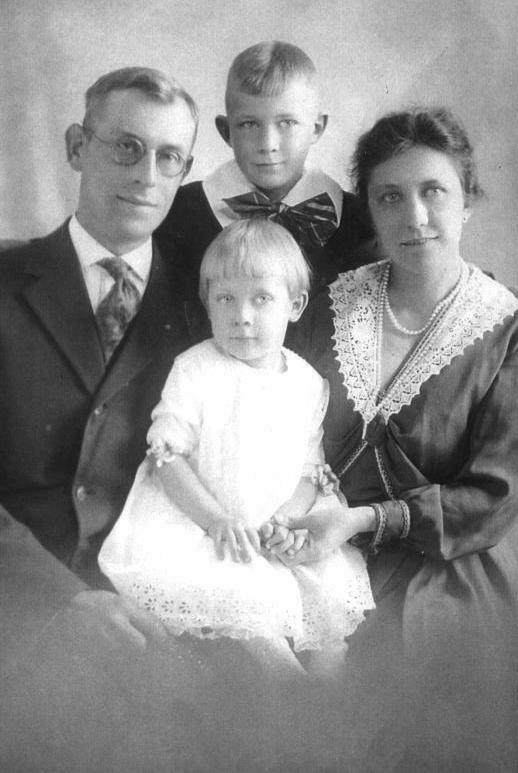 Sponsors were his aunt, Clara (née Ehrler) Wagner and his grandfather, Edward Ehrler. Marriage annotation of "June 20, 1940," is in error. 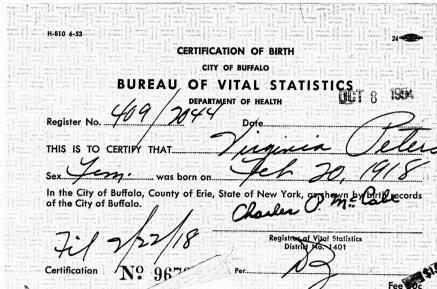 Birth Certificate: Virginia Peters, February 20, 1918, Buffalo, New York. Marriage License: Edward Ehrler Schwert and Virginia Peters, June 29. 1940, Township of Amherst, New York. 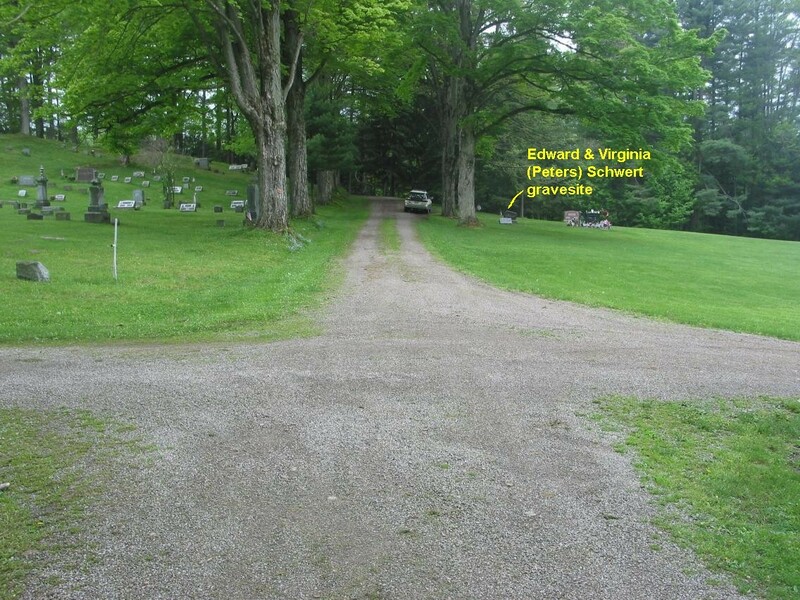 Wedding Announcement: Edward Ehrler Schwert and Virginia Peters, June 29. 1940. Draft Card: Edward Ehrler Schwert, October 16, 1940. 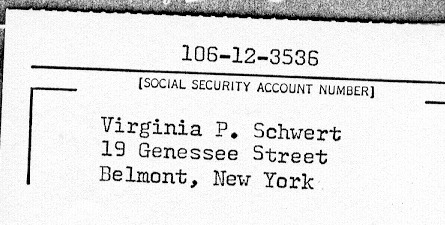 Social Security Card: Virginia (née Peters) Schwert. 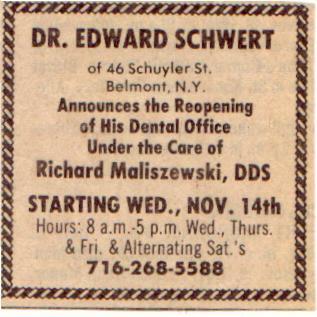 Retirement Announcement: Edward E. Schwert, DDS, 1984. Obituary: Virginia (née Peters) Schwert, died April 11, 1998, Jones Memorial Hospital, Wellsville, NY. 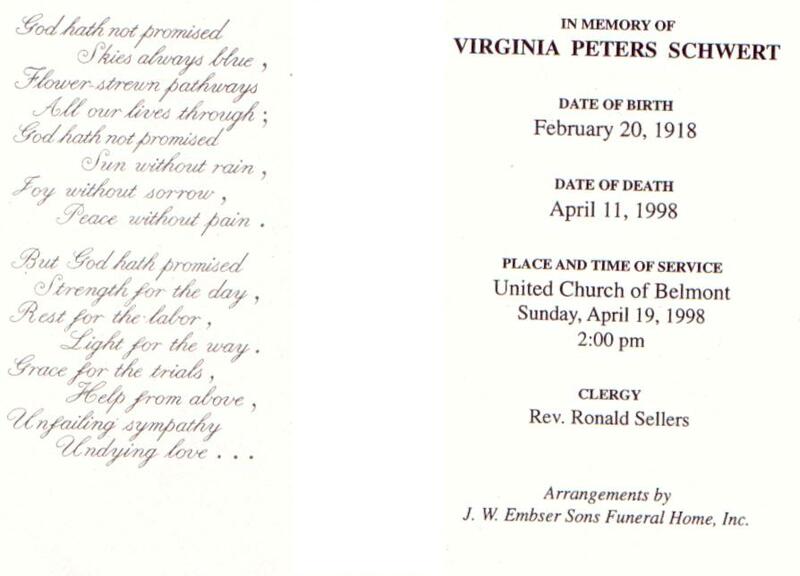 Funeral Card: Virginia (née Peters) Schwert, died April 11, 1998. Funeral service at the United Methodist Church, Belmont, NY, on April 19, 1998. 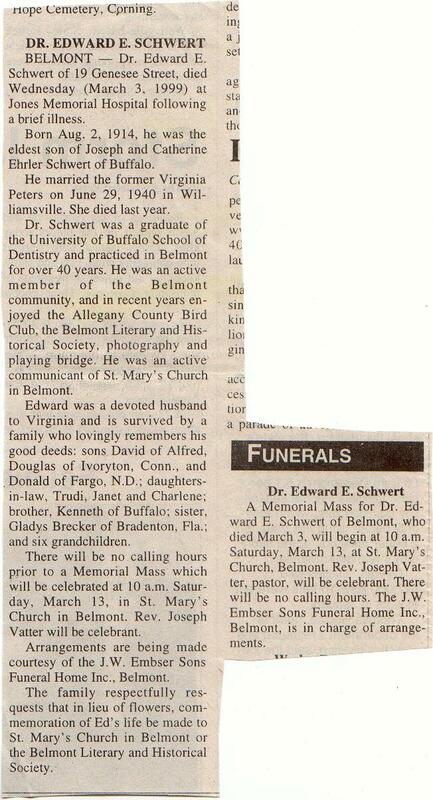 Obituary: Edward Ehrler Schwert, died March 3, 1999, Jones Memorial Hospital, Wellsville, NY. 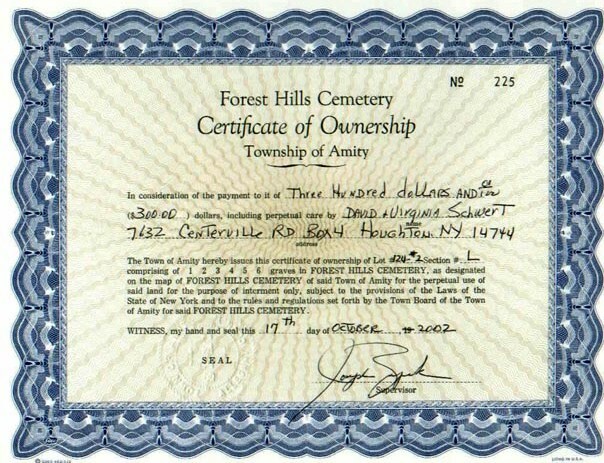 Cemetery Record: Purchase record for cemetery plot of Edward Ehrler Schwert and Virginia (née Peters) Schwert, Section L, Lot 124-2, Forest Hills Cemetery, Belmont, NY. An error exists on this purchase record; paternal care should read "David and Trudi Schwert."